Putting a few things together, it is clear, not just that E.H. Taylor whom I discussed yesterday used backset – the spent beer of a previous distillation – to yeast his mash, but that he got the idea from Dr. James Crow. Correlatively, it shows that adding backset to mashes was not the only part of Crow’s important work: the use of it to substitute for yeast was just as important, indeed more so from the standpoint of flavour and quality. Crow was a Scottish physician who came to America in 1823 and worked in distilling for the Pepper family. They were long-established distillers in Kentucky, claiming origins from 1776 in pre-Kentucky Virginia. Their stone buildings now house the Woodford Reserve facility where Brown-Forman makes bourbon which incorporates some pot still whiskey. [Taylor’s] beer was a creamy liquid, rich in yeasting power. His fermentation was faultless. This elliptical statement is nonetheless clear: the spent beer, or backset, Taylor used had “yeasting power” and was “creamy” from evident biological activity. Carson saw, then, the significance of this part of Taylor’s remarks quoted in E. Stoddard Johnston’s 1896 history of Louisville I linked yesterday. While Oscar Pepper was carrying on the business, James Crow came to this country and applied to him for employment and got a position in the business. Mr. Pepper noticed the fermenting capacity of spent beer, and mentioned one day to Crow his belief that a mash could be fermented by its use without yeast. They commenced a series of experiments, and the result was the discovery of sour mash whiskey. It makes sense Oscar Pepper would know about backset, as recipes from the frontier for sour and sweet mash whisky had been known since the early 1800s, see e.g. these recipes in Henry G. Crowgey’s Kentucky Bourbon: The Early Years Of Whiskeymaking (1971). By starting in distilling in 1776*, perhaps the family had used the technique, or discussed it with neighbours who used it. To say Crow or even Pepper “discovered” sour mash would not be correct but as Crow was a trained scientist, he used scientific methods to approve and refine the technique. Taylor was primarily a business figure, and he worked with practical distillers and chemists but there is no cause for thinking he came up with the notion. Bonfort’s explanation makes good sense, but what is the link between Crow-Pepper and Taylor? Chuck Cowdery, in his excellent Bourbon, Straight: The Uncut and Unfiltered Story of American Whiskey (2004) explains that Taylor’s first distilling venture, W.A. Gaines & Co., bought the Pepper/Crow distillery in 1867. Taylor had known Crow, and was close to the Pepper family (see Cowdery again on this). It seems obvious that Taylor’s knowledge and respect for sour mashing all derived from James Crow’s work at the historic Pepper distillery (near Versailles, KY) which Taylor’s business interest acquired. Understanding that Crow and Taylor used backset, not just as mashing liquid, but to stand in for yeast, answers a question that has long puzzled me. It has often been written, indeed ever since the later 1800s, that the sour mash method was less efficient than sweet mash bourbon production: it made less alcohol but better whiskey. But if a sterile spent beer substituted for part or all of the water in mashing, it is hard to see why inefficiency would result. Whatever mashing liquid is used, yeast must still be added and it will consume the grain sugars the same way. If anything, one would expect sour mashing to be more efficient. Its well-known control of unwanted bacteria ensures the yeast can do its job of making alcohol unhindered. Bacteria love consuming sugar, but they don’t excrete alcohol as a result. The answer lies in the fact that Crow’s sour-mashing had the backset doing the fermenting, via the action of wild yeast or a cocktail of them. That yeasting capability was never as strong and reliable as a selected, jug-stored, uncorrupted yeast. This is why the yield in alcohol fell a gallon or more under what people could achieve with a carefully-selected jug yeast. In conventional beer-brewing, you would call the result under-attenuated. The flipside was, in Taylor’s explanation, that the unusually high level of unfermented sugars remaining in the mash contributed positively to flavour, i.e., when put through the still. Whether sour mashing in this old way had the taste results claimed by Taylor, I can’t say, but generations of whiskey-makers seemed convinced of it in the 19th century. Also notable is Taylor’s explanation, in J. Stoddard Johnston’s whisky chapter again, that a slow fermentation with backset produces less fusel oils than a faster, hearty ferment from freshly-added yeast. It would be interesting to hear the views of modern fermentation science on this. Final point: when distilling began anew each season (Spring and Fall), the first tubs were set with added yeast unless backset was obtained from another working distillery. But after a few fermentations and distillations, you had enough backset to use only that going forward. This is made clear in C.K. Gallagher’s impressive article from 1883 in The Pharmacist And The Chemist on the Kentucky sour mash method. By the 1900s, considerations of yield became primary and/or people felt sour mashing a la Crow and Taylor didn’t produce special effects on palate. No large distiller today uses backset to ferment. Few if any craft distillers would, either. If one has tried it, I’d like to know. The upshot: today’s sour mash is quite different from the 19th century’s. Quite possibly, no whiskey palate achieved today can approximate James Crow’s and E.H. Taylor’s finest bourbon. *Note added June 15, 2016: this date is probably too early. There is contradictory information about when Elijah started to distill, and it is known that his son Oscar built a distillery in the 1830s where Crow was ultimately employed. I am not concerned here with the specifics of Pepper family distilling history except to note that Bonfort’s, a reputed industry journal of the 1800s, associated Oscar Pepper and James Crow with the sour mash method which eschews use of added yeast. 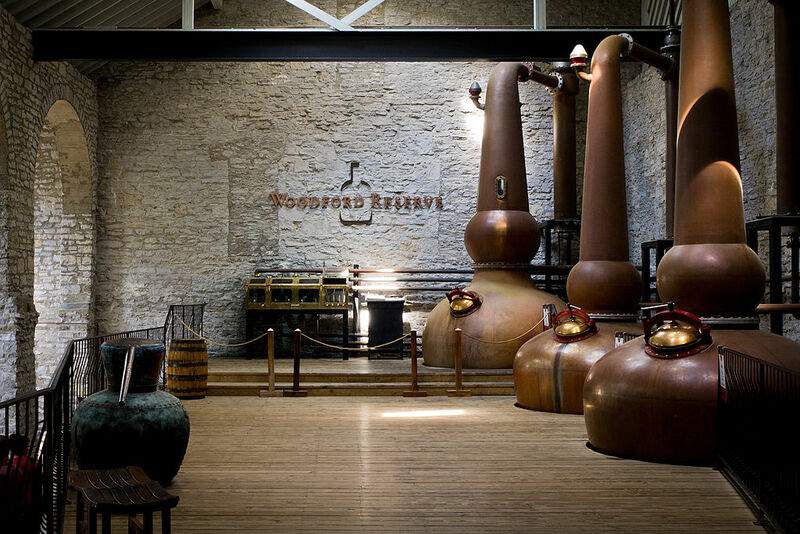 Note re image: the image above, of the still room at Woodford Reserve Distillery, Versailles, KY, is in the public domain and was sourced here. Believed available for educational and historical use. All feedback welcomed.